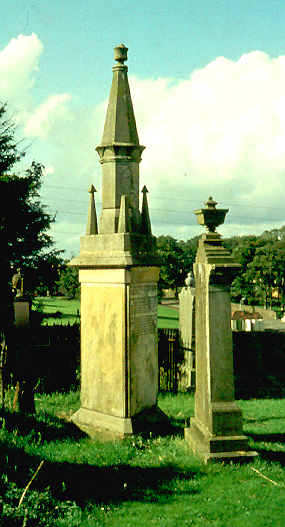 The tall memorial to the two Eaglesham martyrs is located in the old part of the churchyard. Here lies Gabriel Thomson and Robert Lockhart, who were killed, for owning the Covenanting Testimony, by a part of Highland men and dragoons under the command of Ardencaple, 1st May 1685. The sepulchre-studded graveyard at eighteenth-century Eaglesham Parish Church is a peaceful place for contemplation and prayer. The sacred sanctuary is also the burial place of Covenanters Gabriel Thomson and Robert Lockhart, who were shot and killed on the bleak, windswept moors, a few miles away, because of their religious beliefs. According to the inscription on their elegant tombstone, standing majestically in the shadow of the lime-washed kirk's soaring clock steeple and beside a graceful yew tree, the symbol of eternal life and immortality, the pair ‘were killed for owning the Covenanted testimony by a party of Highlandmen under the command of Ardencaple, 1st May, 1685.’ The epitaph continues, ‘These men did search through moorland moss to find out all that had no pass. These faithful witnesses were found and murdered upon the ground. Their bodies in this grave do lie. Their blood for vengeance yet doth cry. This may a standing witness be, for Presbytery gainst Prelacy.’ Above the inspirational inscription are the chiselled words: 'Psalm CXII & VI ‘The righteous shall be in everlasting remembrance.’ Gabriel Thomson and Robert Lockhart are two of Scotland's less well-known Covenanting martyrs. 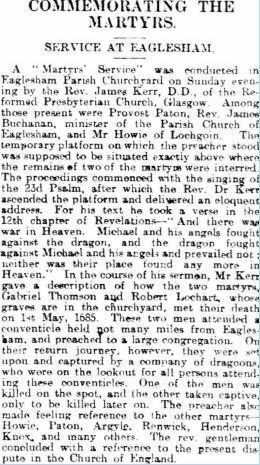 But they will forever belong to the Great Cloud of Witnesses who shed their blood in pursuit of what the poet, William Cowper, described as Man's noblest destiny: ‘Our claim to feed upon immortal truth, to walk with God, to be divinely free, to soar and to anticipate the skies.’ In the hallowed surroundings of the village churchyard, we remember and revere the valiant Eaglesham martyrs who were faithful unto death and won the martyr's crown.